Magic Resistance. The satyr has advantage on saving throws against spells and other magical effects. Ram. Melee Weapon Attack: +3 to hit, reach 5 ft., one target. Hit: 6 (2d4 + 1) bludgeoning damage. 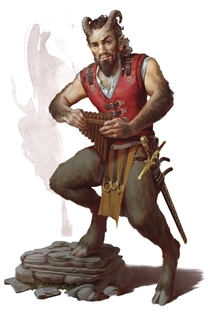 Satyrs are raucous fey that resemble stout male humans with the furry lower bodies and cloven hooves of goats. They frolic in wild forests, driven by curiosity and hedonism in equal measure.